Just because the 2015 tax year ended on December 31 doesn’t mean you’ve missed the boat on late IRA contributions. You can still add to your IRAs until the tax day deadline, April 15, for the 2015 tax year, there are limits though, and the IRS determines how much you can contribute in any given tax year toward traditional, Roth, and Simplified Employee Pension (SEP) IRAs. IRAs are outstanding vehicles for retirement planning. Regular contributions serve to build up your retirement fund, but they may also offset your taxable income. That reduces taxes due for the year in which they were made (check with your tax advisor for details). Another advantage: maximizing your IRA contributions can also result in a more favorable asset determination when applying for a child’s college funding. That’s a big bonus for parents of college bound kids. Want to learn more? 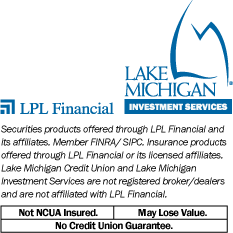 Contact Lake Michigan Investment Services for a free analysis. Call (616 or 800) 242-9790 ext. 6301 or go online at lmcu.org/investments.